Where: Courtenay Fiesta, Campbell River Fiesta, Black Creek and Union Bay Fall Fairs. Glacier Granny crafts are high quality and beautifully designed. 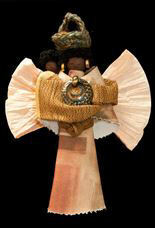 They include Aids Angels, necklaces, and one-off items such as wall hangings, smocked dresses. November and December 2011: $6,757 was raised from craft fairs and $,1884 from stores where we sell goods. October, November & December 2012: $7,250 from AIDS Angels alone. 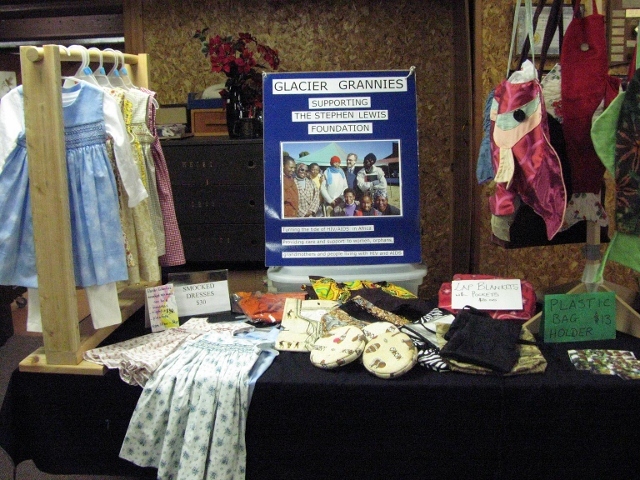 Thanks so much to all the Glacier Grannies and grand 'others' (eg family members who contribute in many ways) for the time and effort that goes into making and selling the items. Also thanks to the venues where goods are sold, the different dates & locations give more people an opportunity to buy. Where: d'Esterre House, 1801 Beaufort Avenue, Comox, B.C. Kazuri Jewelry is made by women in Kenya. It is a Fair Trade organization employing more than 300 people. Two women in Ottawa bring the jewellery to Canada and make it available to non-profit groups. All revenues are distributed 41% to Stephen Lewis Foundation, 47% to company in Kenya, 12% for sales tax. Visit Kazuri America for more information and photos of this beautfiul jewellery. November 6th was very successful, a crowd of people came out to shop for themselves or for Christmas gifts! 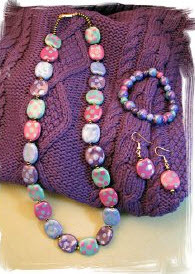 Another $2,530 was sent to the Fair Trade factory in Kenya where the jewelry was made. It takes a village to stage a Kazuri Jewelry sale! From baking pies to packaging jewelry to selling, serving, decorating and cleaning up after, these grannies pitched in: Ruth M, Barb L & Barb T, Lynn R, Brenda C, Marilyn H, JoAnn L, Karin H & Karen J, Jan H, Kate C, Florence W, Linda M, Joyce R & Joyce L, Ardith C, Virginia P, Merilee C, Sue H, Colleen B, Gail H & Gail E & Gail McM & Gail B, Juanita O, Francine N, Mavis A, Lorraine W, Yvonne R.
And finally a big thanks to Comox Valley Seniors Association (d'Esterre House) for the use of their facilities! Guest speaker Shannon Brown shared stories about her volunteering experiences in Arusha, Tanzania located at the edge of the Serengeti. Doors opened at 6:30 pm, allowing time to buy Kazuri jewelry, Campbell River grannies handmade crafts, Glacier Grannies (Courtenay) Angels and delicious sweets & coffee prepared by NIC culinary students before Shannon's entertaining and informative talk. The second Grannies Gathering focused on the theme of Evolving Collaboration. Representing the Stephen Lewis Foundation was Zahra Mohamed, the new Grandmothers Campaign Co-ordinator, and Alexis MacDonald the Director of External Relations. Zahra and Alexis spoke to us and did a great job of answering our questions. We shared ideas and learnt about other groups' fundraising projects & ideas. Perfect cycling weather accompanied the 23 grandmothers and grand others on the 280 km 5th annual Campbell River to Victoria tour. All the local granny groups supported the riders: Campbell River Grandmothers to Grandmothers group gave a lavish potluck supper the night before then next morning cheered them on their way, Merville Grand Mothers had cold watermelon drinks ready at Black Creek Mini Golf, Denman Island GLADS had a gourmet lunch waiting in Simms Park, Courtenay. 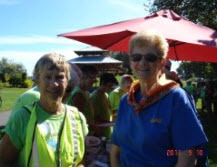 Some of the Glacier Grannies joined in for lunch and chat with the riders, Comox Valley Record newspaper took pictures, Shaw Cable videotaped cyclist's comments about the ride. Off again peddling to Buckley Bay ferry terminus where Hornby Island HUGGS provided ice water, fresh fruit and treats. That day's excursion ended in Qualicum. Jen B of Courtenay was a guest rider, helping the cause. Barb F from Glacier Grannies is very happy to see pledges topped her goal. She will be sending over $4,425 to the Stephen Lewis Foundation. Wow! Well done Jen, Barb and all the cyclists! Total raised so far: $44,987. For more information about this ride and the final amount raised, please go to victoriagrandmothersforafrica.